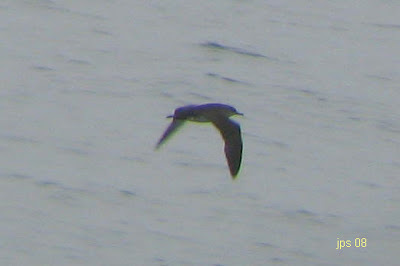 A return visit to Hatfield this morning to check for any changes in the shorebird situation from the previous day. The American Golden Plovers and Lesser Yellowlegs had gone, and for a while I thought Killdeer was going to be the only species present in the fields. On my fourth telescope scan of the same potato field I found a handsome but distant Buff-breasted Sandpiper, in fact too distant to attempt any digiscope shots. Having watched it for about 5 minutes with 8 Killdeer, 2 Horned Larks and a couple of American Pipits, the whole field of birds was spooked by a Sharp-shinned Hawk. The Killdeer took the Buff-breasted with them and despite circling the field a couple of times, never returned landing well to the south. 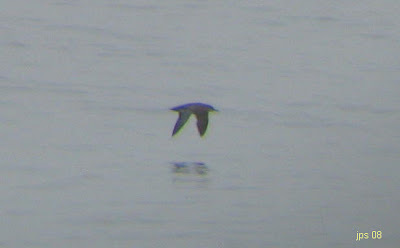 Buff-breasted Sandpiper (center) in flight between two Killdeers - arguably one of the best shots ever taken of the species. 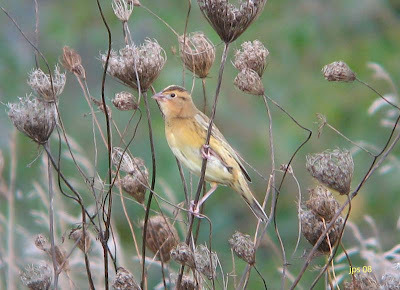 Bobolink - one of two birds together today, at Hatfield. 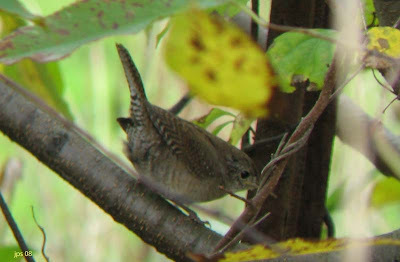 House Wren - one of two birds together at Hatfield. A frustrating morning in many respects. 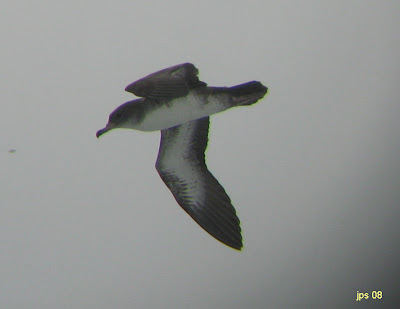 Not only did I miss out on images of the Buff-breasted Sandpiper, but I also had one, possibly two Cackling Geese moving north towards Sunderland along the CT River which would have been my earliest in the valley if confirmed. Even so, the Hatfield area was still extremely busy with plenty to see, mostly Savannah, Song and White-throated Sparrows, increasing numbers of Swamp and Lincoln's Sparrows and a couple of Bobolinks together. 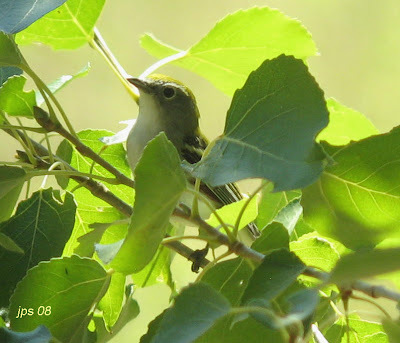 One small thicket held 2 Blue-headed Vireos, 5 Palm Warblers, 1 Tennessee Warbler. 3 Purple Finch and a couple of House Wrens. Blue Jays filtered across the fields all morning. Still a joy to be out! 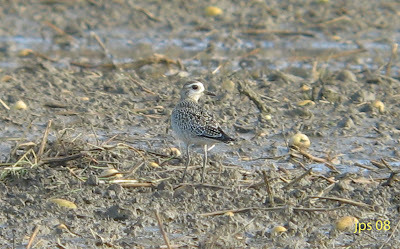 Thanks to a post from Mark Fairbrother on the Massbird listserve, I went out this morning and found six pristine juvenile American Golden Plovers favoring flooded potato fields in beautiful agricultural Hatfield. The birds had moved north from Mark's original posted location, and had I not walked out along the farm tracks to get closer to a Lesser Yellowlegs......well, I think I would have probably missed them altogether. They simply weren't visible from the main road. It's been a while since I've chased some good shorebirds locally, but I thoroughly enjoyed watching these beauties this morning. 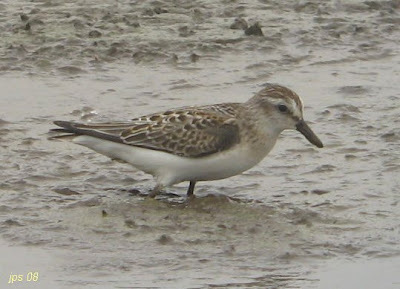 The area (former Hatfield-Pilgrim Airfield) is reasonably well known for attracting shorebirds, and the fields on the western side of River Road held no less than eight Buff-breasted Sandpipers in late August 2005, featured here on my old website. 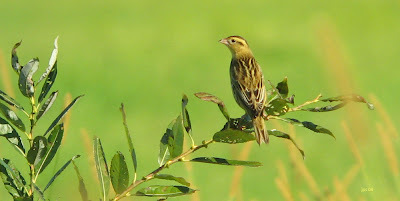 The whole area was generally 'birdy', mostly sparrows with over 60 Savannah, some Song and about 3 each of Swamp and Lincoln's Sparrows, and along one of the weed-filled ditches, a rather smart Bobolink. 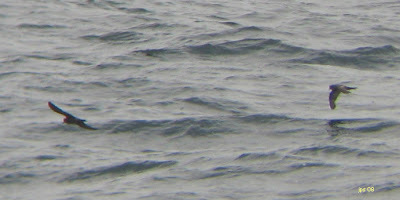 American Pipits featured this morning too, mostly singles flying south. Raptors, well good views of Northern Harrier, Merlin, plus 3 each of Sharp-shinned Hawk and Osprey, both of the latter migrating south along the Connecticut River. All in all, a fine autumnal morning to be out. American Golden Plovers - six juveniles together at Hatfield, just south of the Hampshire/Franklin County line. 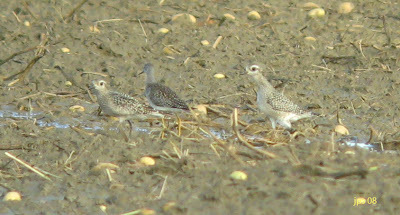 Lesser Yellowlegs with American Golden Plovers - Hatfield. 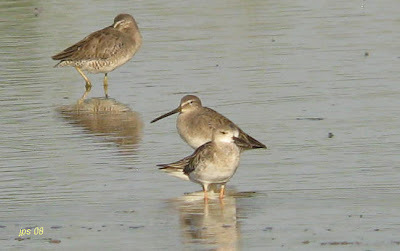 American Golden Plovers and Lesser Yellowlegs (second from right), Hatfield. The largest flock of AGPs that I've seen in the Pioneer Valley. Bobolink - found feeding along the weed-filled ditch shown below (Sugarloaf Mountain in the background). 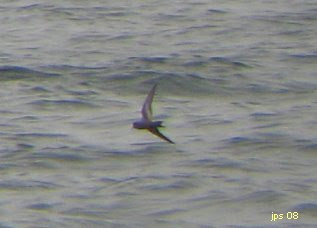 Hadley migrants - Sept 28th. 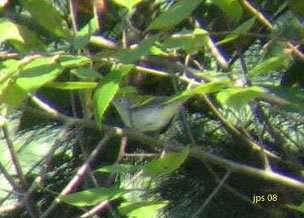 Blue-headed Vireo - Moody Bridge Road, Hadley. Black-and-White Warbler - Moody Bridge Road, Hadley. 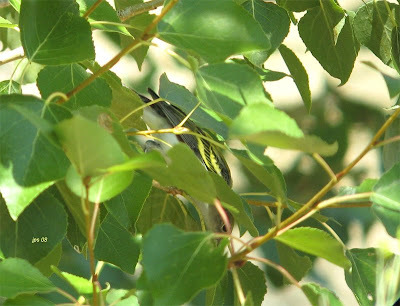 Black-throated Green Warbler - Moody Bridge Road, Hadley. Departed late this morning and without any real plan. What a muggy morning it was too with complete cloud cover, high humidity and an abundance of mosquitoes - it really felt more like late July than late September. Eventually found a few migrants down on Moody Bridge road in Hadley, but I had to work for them. 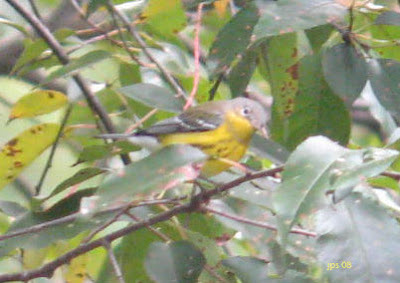 Perhaps the best would have been a single Swainson's Thrush, but also of note were 3 Blue-headed Vireo, 2 Red-eyed Vireo, 2 Northern Parula, 3 American Redstart, 5 Yellow-rumped Warbler, 2 'Eastern' Palm Warbler, 2 Black-throated Green Warbler and a single Magnolia Warbler. A little closer to the Connecticut River, the corn fields along the Aqua Vitae road were much better and actually quite busy with sparrows, mostly Savannah and Song Sparrows, but several Swamp and a single Lincoln's. 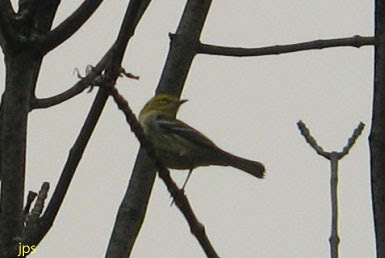 At least 15 Indigo Buntings and 5 'Eastern' Palm Warblers were present as well. A most impressive flock of 6,000 Red-winged Blackbirds lurked in the tall trees lining the river. Raptors attracted to all this activity featured a juvenile Peregrine (probably tundrius), a Merlin, a Cooper's Hawk, and two migrant Ospreys drifted south together around noon. 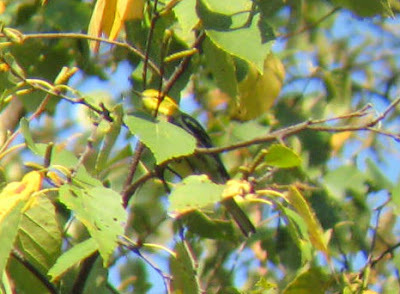 Closer to home, a Yellow-bellied Sapsucker was on N. Whitney Street in late afternoon. 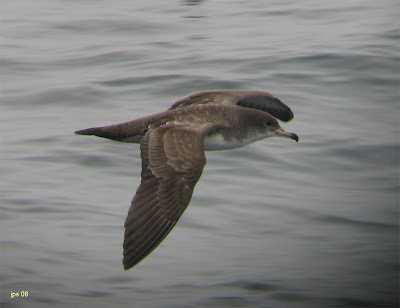 More images from the Monterey Bay 'Shearwater Journeys' pelagic on September 7th, plus a couple of Black-vented Shearwater images taken on the crossing of the Santa Barbara Channel to Santa Cruz Island on September 4th. 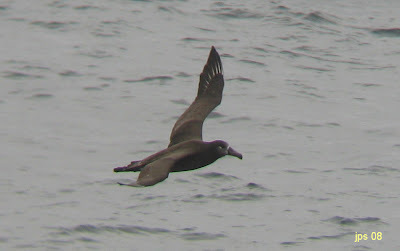 Black-footed Albatross - A most successful trip with about 40 seen in all. 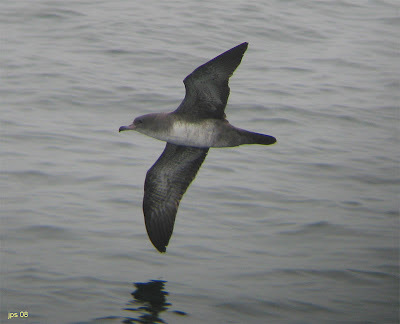 Ashy Storm-Petrels - A loose flock of around 350 birds, but somewhat surprisingly nothing else of note identified with them. 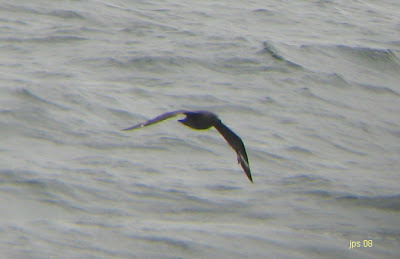 South Polar Skua - A good day with about 8 seen, none of which really lingered around the boat. 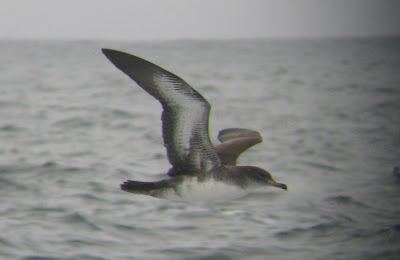 Black-vented Shearwaters - About 30 seen on both crossings of the Santa Barbara Channel to and from Santa Cruz Island. 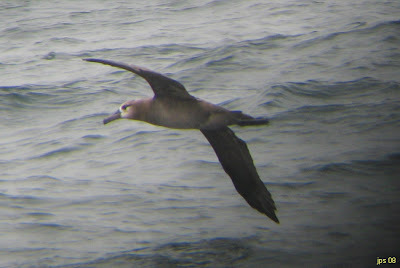 All of the following are digi-bin images (Canon Powershot A560 with Leica 8 x 42 binoculars) taken on a very successful 'Shearwater Journeys' pelagic out of Monterey on September 7th. Each image can be enlarged by a single click. 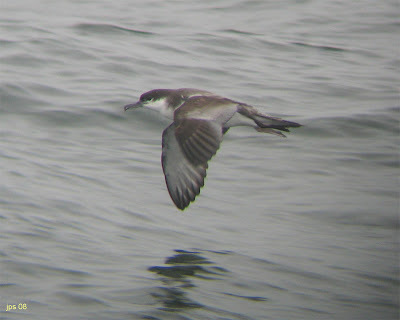 Buller's Shearwater - Monterey Bay. 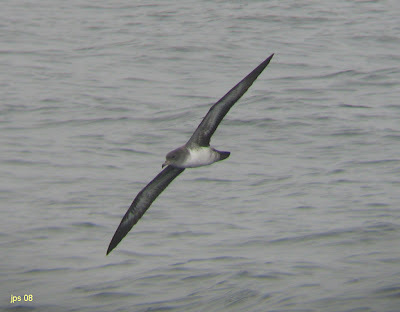 Pink-footed Shearwater selection - Images 2 through 6. 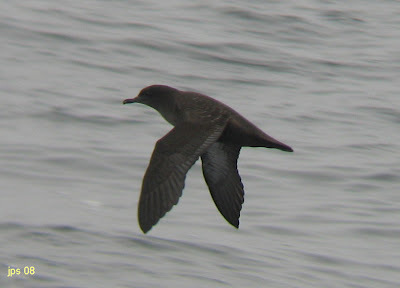 Sooty Shearwater - Monterey Bay. More to come from this excellent trip. A return visit to the riverside fields at Hadley found generally fewer warblers today but a major influx of sparrows, with 50 White-throated, 35 Song and about 4 Lincoln's Sparrows moving around in a roving flock. 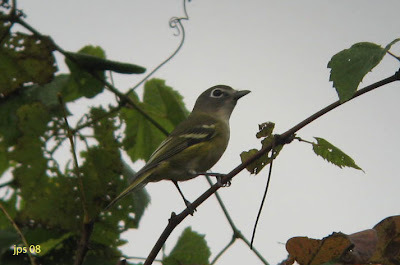 The damp, foggy conditions felt good for a warbler arrival but it wasn't to be, though the variety was still nice; 6 Yellow-rumped, 5 Blackpoll, 2 'Eastern' Palm, Chestnut-sided and Black-and-white Warblers, plus 3 American Redstarts and over a dozen Common Yellowthroats. 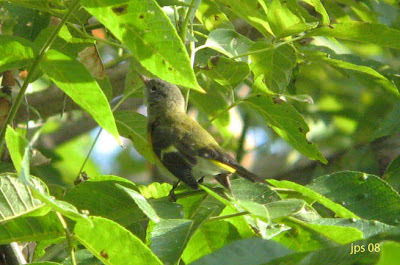 There was also 3 each of Blue-headed and Red-eyed Vireos, 3 Scarlet Tanagers and a flyover Bobolink. 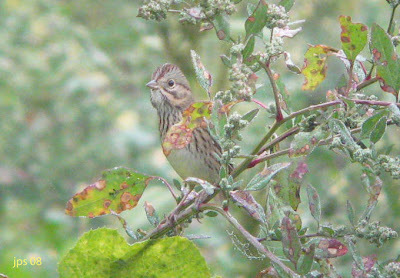 Lincoln's Sparrow - One of about four in the Hadley fields today. 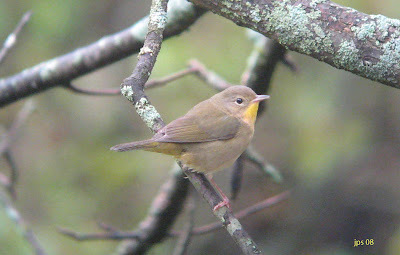 Common Yellowthroat - Female, probably first-winter. 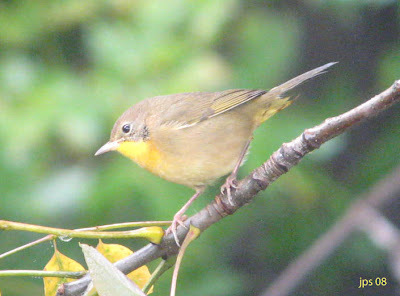 Common Yellowthroat - First-winter male. On the Amherst bike path whilst walking with Matan - 7 Yellow-rumped Warblers and 3 Brown Thrashers, plus still plenty of Catbirds. Another beautiful fall day. Went out for a lovely neighborhood walk (N. Whitney Street, Amherst) in the morning with Matan in the stroller. 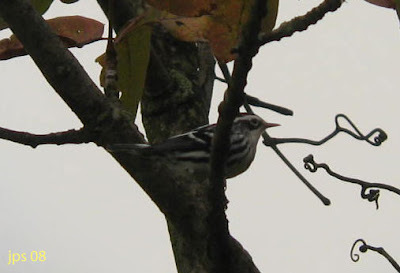 Migrants seemed quite plentiful along the streets with 5 Yellow-rumped Warblers, 5 Black-throated Green Warblers, 3 Blackpolls and bird of the morning, a first-winter Chestnut-sided Warbler close to Wildwood School. Also of interest, Red-breasted Nuthatch, 2 Pileated Woodpeckers, 3 Eastern Phoebes and an Eastern Wood-Pewee, all foraging along the quieter streets. 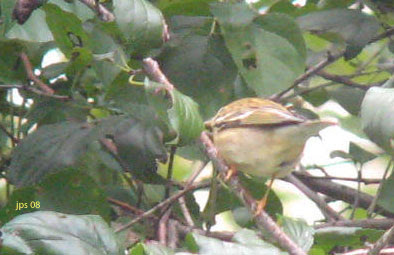 Hadley migrants - Sept 22nd. 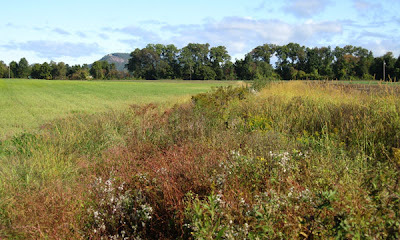 Had a nice run out to the Connecticut River at Hadley this morning, checking several scrubby tangles and field fringes. Nothing too exciting but good to be out in the morning watching migrants filter through the bushes. 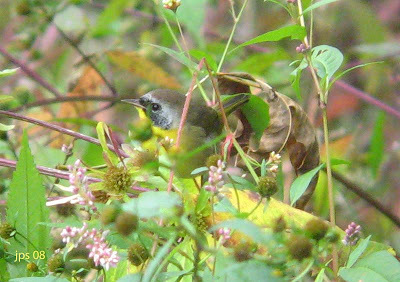 Most noteworthy were an Ovenbird, 2 Blackpoll Warblers, 3 Magnolia Warblers, 3 American Redstarts, 1 Black-and-White Warbler, 12+ Common Yellowthroats, 5 Red-eyed Vireos, 1 Blue-headed Vireo, 2 House Wrens and at least 6 White-throated Sparrows. 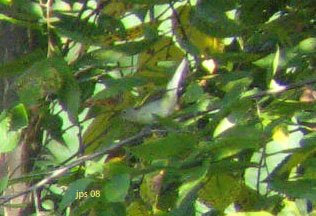 Blackpoll Warbler - Images 2 & 3. First-winter. 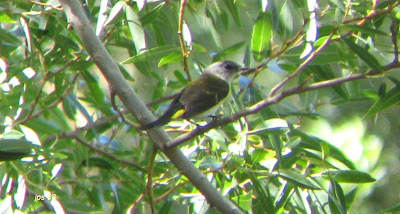 California notables (Birdfinders Sept '08). First images from the recent, and highly successful, Birdfinders tour of Southern and Central California during September 3rd - 18th. 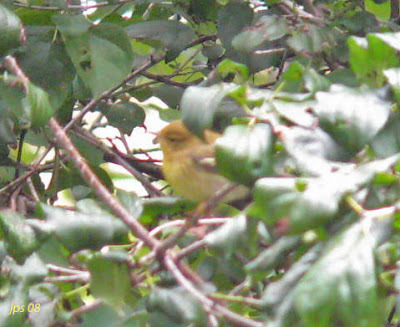 This image set represents some of scarcer birds recorded on the tour, some of which we don't find every year, especially the depicted warblers. 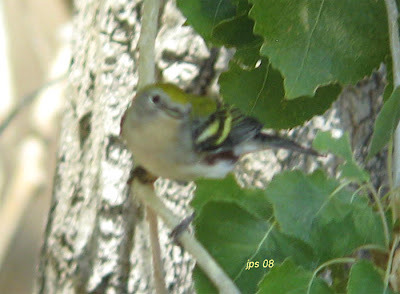 Chestnut-sided Warbler - Images 1 - 3, Butterbredt Spring, Kern Co. September 12th. 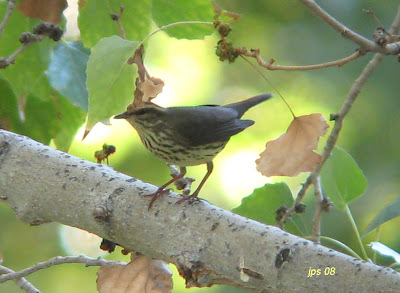 Northern Waterthrush - Silver Saddle Resort, Kern Co. September 12th. 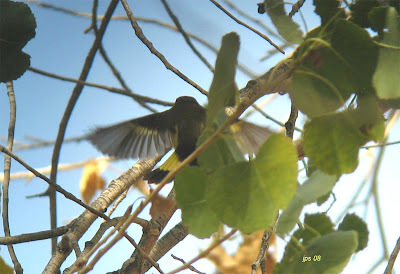 American Redstart - Images 5 & 6. 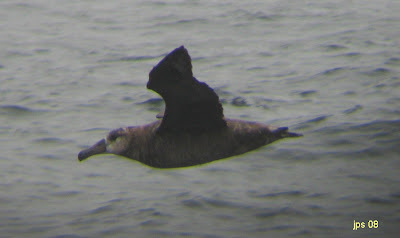 One of three birds present at Butterbredt Spring, Kern Co. September 12th. 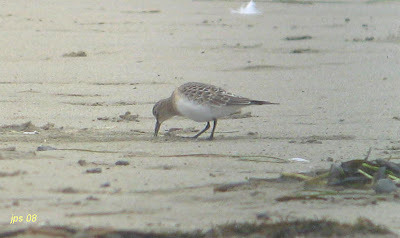 Semi-palmated Sandpiper - Images 7 & 8. 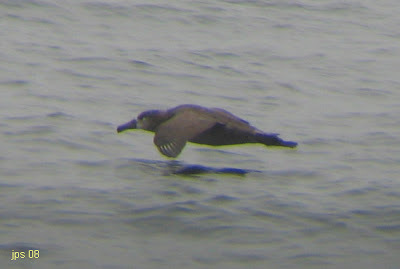 Juvenile, Moonglow Dairy, Monterey Co. September 8th. 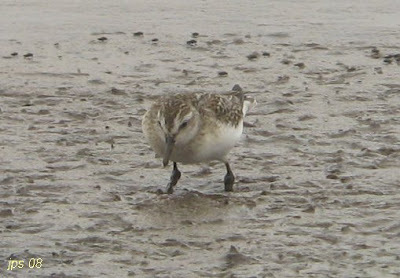 Baird's Sandpiper - Juvenile, Morro Bay, San Luis Obispo Co. September 6th. 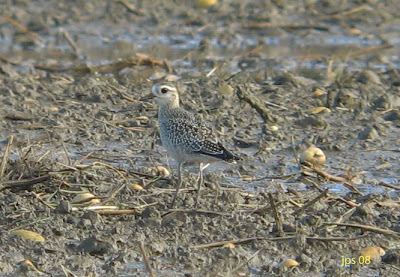 Ruff - Adult, Finney Lake WMA, Imperial Co., September 14th. 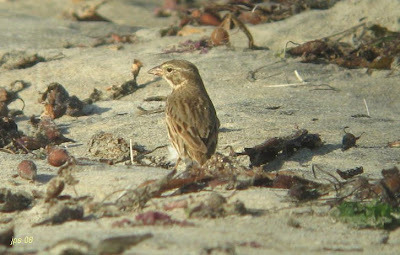 Large-billed Savannah Sparrow - Imperial Beach, San Diego Co. September 16th. 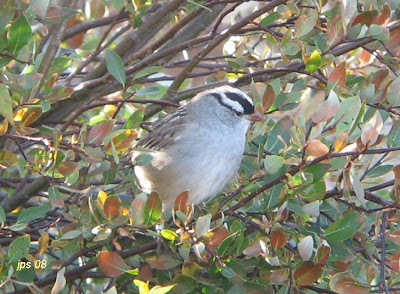 White-crowned Sparrow - Adult showing characteristis of Z.i. orianatha, Tuolumne Meadows, Tuolumne Co., September 10th. 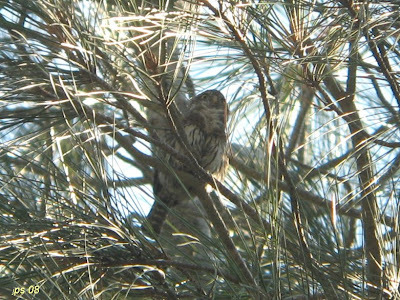 Northern Pygmy-owl. Merced River, Mariposa Co., September 9th. 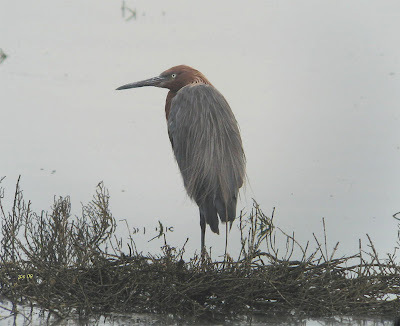 Reddish Egret - One of two present, Bolsa Chica Ecological Reserve, Orange Co. September 18th. 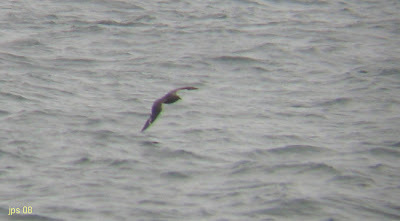 More images to follow from this excellent trip.